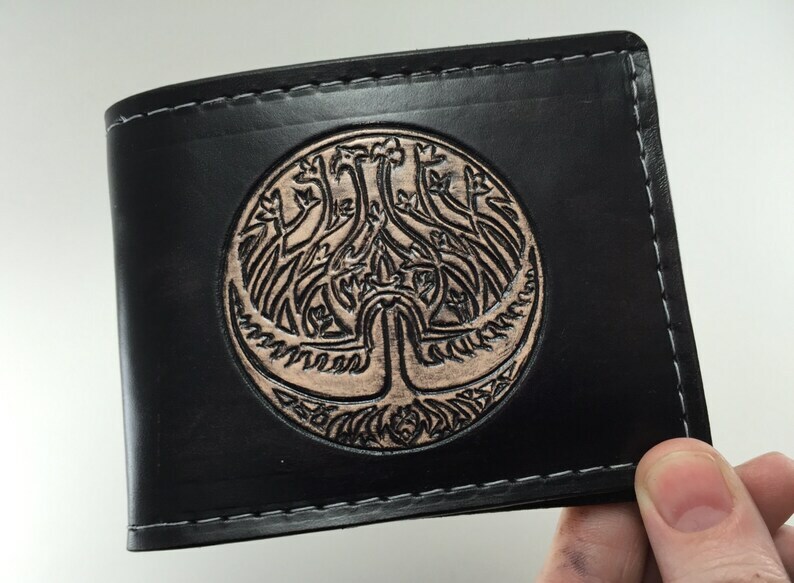 What Prince Nuada should have done was pull out this wallet to buy a drink for the big red guy instead of that whole stabby stabby business. Everyone goes home happy. 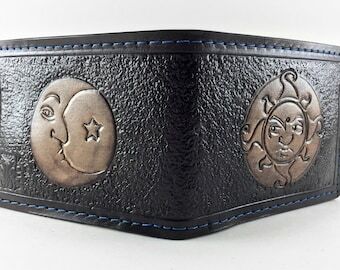 The royal seal of Bethmoora is hand tooled on the front of this wallet, the whole thing is antiqued with a deep black and sewn with silver colored thread. The interior has two long bill pockets, six upward facing card pockets, and a receipt pocket on each side. Folded, this wallet measures approximately 4.5 by 3.5 inches (9cm x 11.5 cm). Seller is super accommodating, excellent communication, and did a perfect job on a custom piece. I got it just in time for Christmas which I wasn't even expecting because I waited so long to ask. The piece itself is gorgeous and well made. It looks like the pictures. The colors are just as vibrant and the design perfect! This was a Christmas gift for my partner and his brother threatened to steal it. I guess that's both a good thing and a bad thing if people want to steal the actual wallet itself lol. The point is, he loves it and so does everyone else who saw it! Quick and fast, well made. Custom order. Just as awesome quality as my old one from years past. Can't wait to give it to my pops in Dec. I have had my eye on this wallet for such a long time when it was a custom for someone else. It is beautiful and it is so hard to find things made with the Abhorsen books in mind. Thanks! I accept both payments through Etsy, or Paypal, where you can pay by credit or debit card, or via e-check from your checking account. Items will ship promptly once payment arrives and/or e-checks have cleared. PLEASE NOTE: I will ONLY ship to addresses actually listed on your Paypal or Etsy account (as opposed to sending a note and telling me to mail it to another address). I'm very sorry - but the address must be the one on your account. Please make sure to keep your address updated in those places! I will do my utmost to make sure you're satisfied with your purchase. I list with clear, detailed pictures, so you really know what you're getting to begin with. If an item arrives damaged, or if you're not satisfied for any reason, please contact me right away, so we can figure out what we can do to put things right. Communication is the key to everyone being happy in the end! The only items I can not accept returns on are orders with designs I have not tooled previously, or that have been personalized in some way. In the event that an item must be returned, I will gladly refund the full cost of your purchase via Paypal or Etsy (depending on how you originally purchased) upon receipt of the item. Items will be shipped within 3 business days after payment is received at the very most -- things often go out on the same day as the purchase. I ship within the United States via USPS Flat Rate Priority Small Box for wallets. Since the pricing is not based on weight, two bifold wallets can fit into a small flat rate box for the same shipping price as one. I charge less than what it costs me to ship - there are never any fees for packing materials or handling. If you'd like to double check actual shipping prices, please visit USPS.com and search for Flat Rate Small Box cost. Also, please be aware of the customs regulations regarding leather being shipped to your country. Some countries prohibit the import of leather (such as Italy), so regrettably, I can not send leather items there. Unless specifically stated in the description, the item for sale is always the exact item in the pictures. All my wallets come nicely wrapped with tissue paper and a seal, so if you're buying a gift, it's ready to hand to someone right out of the box. It's easy to keep leather items looking lovely by treating them with care, and giving them a shine with a soft cloth a couple times a year if they need it. Most of the wallets will actually stay perfectly buffed just by having them in your pocket over time!